The charming setter of the Ateneo de Manila University Lady Eagles Jia Morado is slowly getting ready to play for her team in the UAAP Season 78 Women's Volleyball early next year. But is she ready to juggle both love and volleyball? Jia has been posting "kilig" stuff with her ravishing boyfriend Miguel de Guzman on her social media account. And it seems that its making her more happy. If the 2-time UAAP women's volleyball champion gets inspired by all of this, then there's no reason for Ateneo volleyball fans to worry. 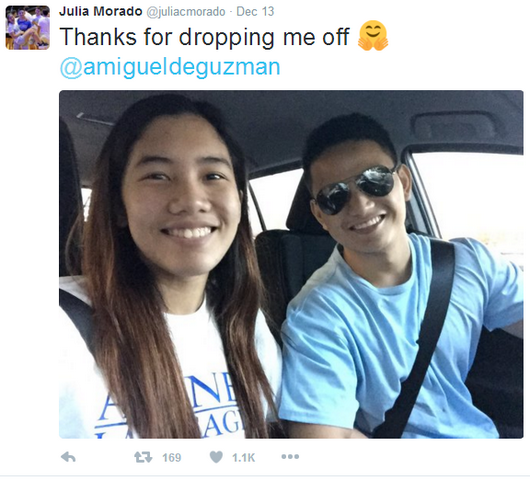 I guess Jia is in good hands and he's making her better as a person heading into the grind called UAAP Volleyball tournament.